For the signature tune, I was looking for something that was both catchy and original and different to everything else I had written for The Celts. And, um, I had been working with the piano and the synthesizer and it happened on the synthesizer that I got this riff. Um, it went sort of ‘bum bum-bum bum-bum,’ you know, this type. And I got excited about it and then I started writing the right hand melody. And it just from there on worked for me really. The video for the song was filmed at the Bodiam Castle in East Sussex, England. 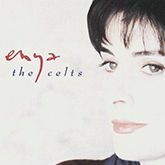 It was Enya’s last video directed by Michael Geoghegan.